London’s latest visitor attraction, The View from The Shard, and bound to be a winner, opens to the public on Friday 1 February at 09:00. The view from the top is fantastic and for a certain generation, brought up with the understanding that London did not have tall buildings, unbelievable. This is what New York is all about. Bookings were available, at time of writing, from the following Sunday, and it is open until 22:00. At £24.95 for adults and £18.95 for children the pricing makes it more expensive than the very popular London Eye (Adults from £17.28), but offers a longer and more instructive package, and vastly more than the excellent Emirates Air Bridge (£4.30), an alternative way of seeing a limited part of the Capital from the air (Here we recommended a round trip, Oyster card accepted, from the North Greenwich complex). 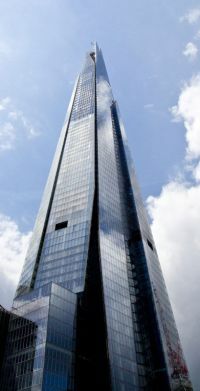 The Shard is Western Europe’s tallest building at 1016ft and its viewing point is almost twice as high as any in London. The massive structure virtually sits over London Bridge Station in the heart of Bermondsey, once very run down, but today a thriving community with City Hall as its centre piece and the revamped Borough Market with its stalls and eateries, a lively tourist attraction on its own merit. It is a meeting place for the young and not so young. The Northern and Jubilee Underground lines serve the station, whilst there is a frequent Thameslink service to Kings Cross-St Pancras (for Eurostar) and onwards to Luton. Southbound Gatwick is but 30 minutes away and the station services much of Kent and Sussex. Situated in the London Borough of Southwark it now likes to be called "The London Bridge Area". The Shard (of glass) is not just a lookout position. Within the complex will be restaurants, offices and a deluxe 202-room Shangri-La hotel, occupying floors 34 to 52 of designer Renzo Piano's iconic tower, with a welcome and concierge desk on the ground floor. The views from every room will be spectacular (no balconies) and there will be a swimming pool, gym and spa on the hotel's 52nd floor. Opening is planned for May. For ‘The View from The Shard’ the reception is well signposted (and you can’t miss the building) pedestrianised from the station, but also including a very busy bus terminal. Guests ascend from the ground floor in one of two high-speed lifts that take just 30 seconds each to reach the public viewing areas on floors 69 to 72. On your journey skywards you are accompanied by a soaring anthem from the London Symphony Orchestra, building anticipation of seeing London like never before. The specially composed music is part of the wider score that accompanies guests through The View from The Shard, also featuring acclaimed London-based chamber choir, the Joyful Company of Singers. 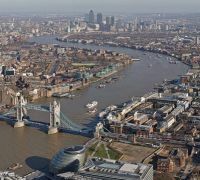 In the viewing galleries, 800ft above London, there is a remarkable 360 degree view, offering visibility up to 40 miles. Available are 12 digital ‘Tell:scopes’ that are new to Europe. The ‘Tell:scopes’, digital telescopes with large touch screens enabling guests to explore the city around them in real-time, as well as offering alternative (pre-recorded) day and night-time views in times of inclement weather. Fully interactive, they are able to identify famous landmarks and places of significant interest in the user’s sight line and provide information about them in 10 languages. Guests are drawn deeper into the story of London as elements of history, and images, appear on screen. In total, 200 landmarks and places of interest across London are highlighted. It is all very impressive. Take a slow walk around. Find an excuse to use the rest rooms. They have windows too. Make sure you have your camera with you. The View from The Shard is a great new London landmark.